“It is a picture (of India) that is in stark contrast to the emerging face of an economic powerhouse,” said Madhura Kapdi of CRY, a leading Indian charity for children’s rights. In Tumda’s village — a cluster of dusty red-tiled huts — children with reed-thin limbs and wearing tattered clothes lie on mud floors, enervated by malnutrition. Village elders doze in the shade as a hot summer sun beats down on hundreds of miles of arid undulating plains in the western state of Maharashtra, one of the worst-hit by malnutrition. Not far away is Mumbai, India’s financial capital, where skyscrapers gleam along a scenic waterfront, and a shiny parade of chauffeured Mercedes and BMWs deposit captains of industry at their offices. India has long struggled with hunger amid plenty, due to real shortages in its poorest states, shoddy management of food stocks and social injustice. “A lot of times there is very little food. 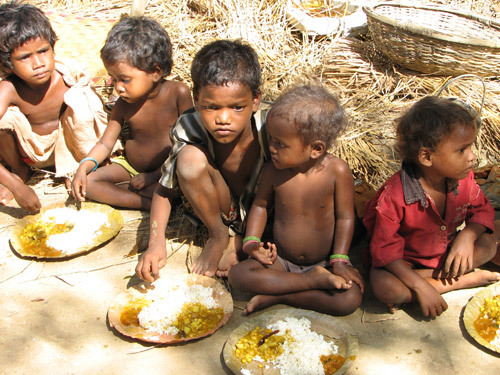 So, this is also about starvation in several pockets of states like Orissa, Jharkhand and Chhattisgarh,” Gopinath Menon, spokesman for Unicef, told Reuters. Despite the need, tons of grain and vegetables rot in granaries every year due to lack of adequate storage. Three decades ago, India proudly announced that a green revolution engineered since independence from Britain had ensured that extreme hunger would be a thing of the past. 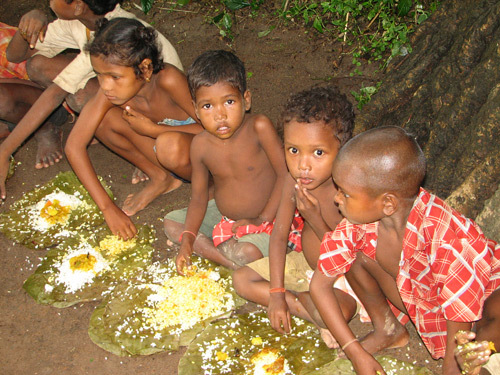 Yet malnutrition persists, often reflecting cultural traditions that are far harder to tackle than a simple lack of food: millions of women are poorly educated, marry when they are barely out of puberty and have little or no say in the nutrition of their children. Across much of India’s vast countryside, superstitious mothers only begin to breastfeed their babies three days after giving birth, believing that the yellow colostrom that a mother produces after a pregnancy and a rich source of protein and protection against infection, is dirty. Experts say widespread malnutrition impacts dramatically on economic growth, with the World Bank saying that in the poorest countries it slashes 3 percent from annual economic growth. Malnourished children will struggle at school — if they go at all — and earn 10 percent less during their working life and are more prone to infections, including HIV. 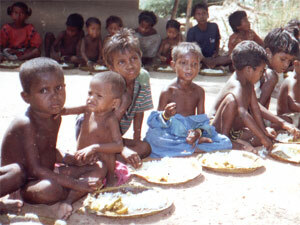 The situation has improved: Ten years ago more than 6 million children died every year in India from malnutrition. But experts say direct nutrition programs are required rather than relying on wealth to trickle down to those at the bottom. 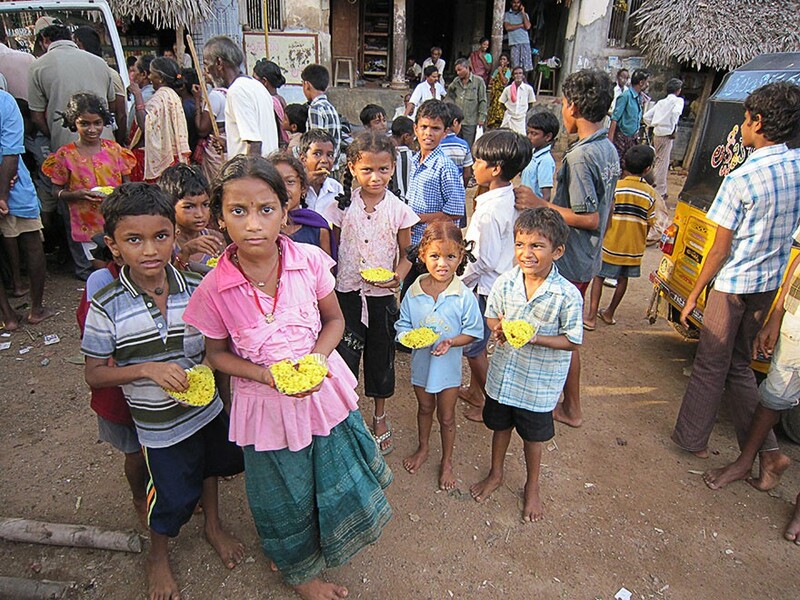 In India each village has a child nutrition center where mothers can have their sons and daughters monitored, but only 15 percent of under-5s attend. For Tumda and millions like her, the immediate fight is for survival. “We have promised the doctors we will take good care of her once she is cured,” said Raju Tumda, the girl’s father, a construction worker who makes less than $3 a day carrying sand bags on his back.